Beautiful wildflowers along the shore of Jack's Pond in Gros Morne National Park in Newfoundland with the scenic landscape of Western Brook Pond in the backdrop. The shores of Jack's Pond in Gros Morne National Park in Newfoundland Labrador is adorned with wildflowers as the beauty of Western Brook Pond decorates the backdrop. 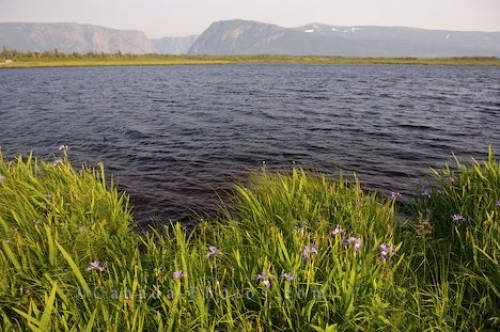 The iris flowers sway in the gently breeze which blows across the rippling waters of Jack's Pond as massive cliffs tower over Western Brook Pond spanning the skyline. Cliffs of Western Brook Pond seen from the shores of Jack's Pond along the trail to the boat dock fringed by Iris flowers, Gros Morne National Park, UNESCO World Heritage Site, Viking Trail, Trails to the Vikings, Highway 430, Northern Peninsula, Great Northern Peninsula, Newfoundland Labrador, Newfoundland, Canada. Picture of the landscape of Gros Morne National Park in Newfoundland from the shores of Jack's Pond near the wildflowers.